I'm Brian Smith, the photographer of Brian's Eye. My interest in photography started over 40 years ago. I was drawn into it by a friend of mine who was a photographer, and who also developed and printed his own work. I eventually spent most of my spare time in his darkroom, developing and printing my own photographs. Through the intervening years I married and raised three girls, but never lost my passion for photography. I was lucky enough to marry a woman who also shared my interest. My interest in photographing people started when my girls were growing up. I was continually photographing them in everything they did. I retired in 2004 and began to devote more time to photography. My wife and I have traveled through-out the United States, Mexico, and Canada taking photographs. One of our goals was to travel to Egypt, which we finally did in 2006. In the 10 days that we traveled thru Egypt, my wife and I together took over 8,000 photographs. My other passion is riding my motorcycle, as you can see from the photograph. Since I live in California I'm able to combine both of my passions year-round. 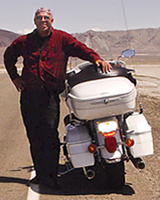 I have ridden my motorcycle through-out every state west of the Mississippi River, taking back roads as I go, stopping continually to take photographs of the landscapes, nature's own world, the man-made world, and people going about their everyday lives.